Working in a large corporate company and being responsible for the employee’s everyday needs can be challenging, especially when staff morale is at stake. 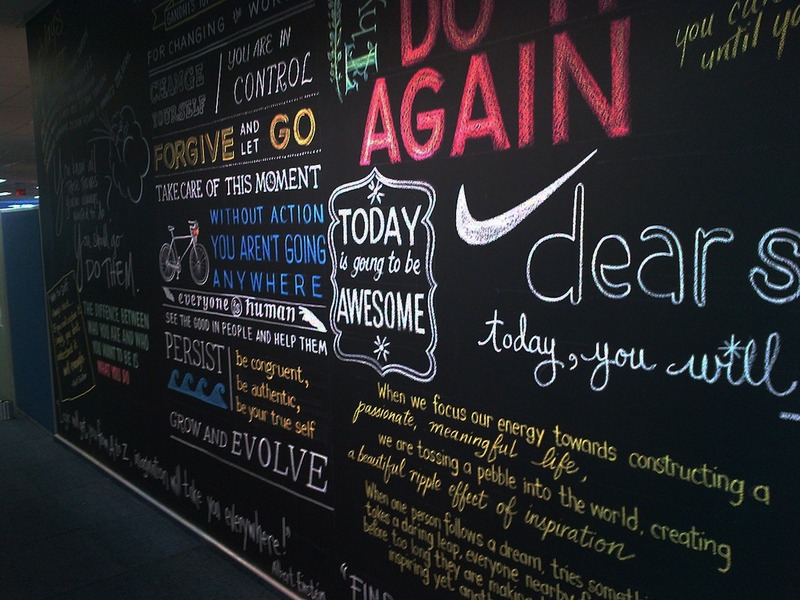 To lift morale, the Head of Internal Communications for Momentum Investments came up with an idea to use the bare walls and pillars throughout the building to display positive messages to the staff. Initially the plan was to do this as a once off project but the results had such a profound effect on the staff that management decided to do this on a regular basis. Three years later, I was practically a member of the team. The monthly updates of themed messages throughout the building became an event everyone looked forward to, especially around the holidays. Staff members would often take breaks to come over and watch me work. They loved asking questions about my technique and some would just sit and watch me work during their coffee break. The work I did became such an integral part of internal marketing I was often invited to join the brainstorming sessions around current and upcoming projects. This allowed me to provide input on messages and suggest relevant themes to fit. She has a great ability to understand and interpret her client’ needs and once she was briefed in she continued on her own, running and managing the projects. What I appreciated about Desmer’s way of work is that she would frequently check in with us to ensure that she delivers the best service possible and she always delivered on schedule and within project requirements. This was one of the most exciting and interesting projects I have ever had the privilege to work. Seeing the effects of the colourful messages on the staff was always such a delight.